MacCaching: “Some people use a Swiss Army Knife to Geocache, we just use a Mac!” A full featured cache manager for Mac with support for paperless caching, using just a Mac! CacheMaps: Tight Integration with GoogleMaps. See your maps before you leave! … all with a easy-to-use and familiar interface! This software connects your Garmin or Magallen based GPS receiver to OS X. Think of MacCaching like iTunes, but for Geocaches. You can create Cachelists (playlists) for caches in a general area, caches you have already found, caches you want to find, caches you own, and more! 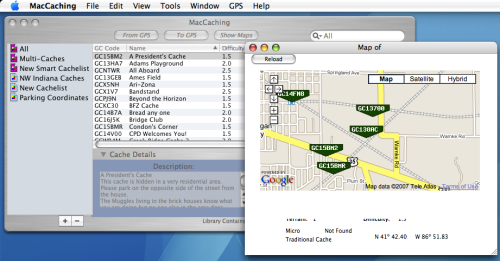 MacCaching is compatible with Geocaching.com’s .LOC and .GPX (single or pocket query) file formats. "I couldn't imagine using anything else on my Mac to Geocache!" "This is like the software my GPS should have come with!" "With MacCaching, I don't need to use Parallels on my Mac Anymore..."
"I love the Mac-like interface for Geocaching." "Finally a Mac Geocaching solution, plus, I can Paperless Geocache with my iPod."